Affiliate links included throughout this post. 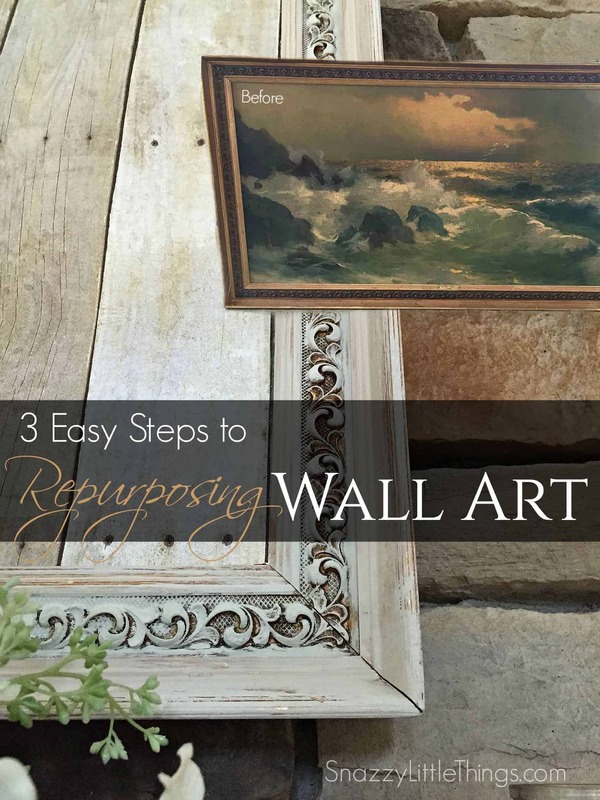 Today I’m going to show you how I repurposed old 1960’s reproduction art into a rustic farmhouse display that fits into my decor. And I’ll also show you how my repurpose is multi-functional — I can still display the original seascape by removing my distressed wood background. 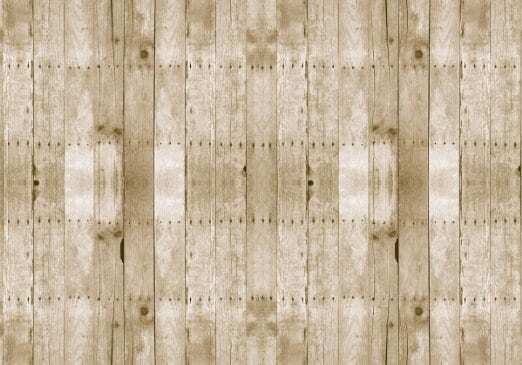 You can easily do this with most any piece of canvas art in your home. 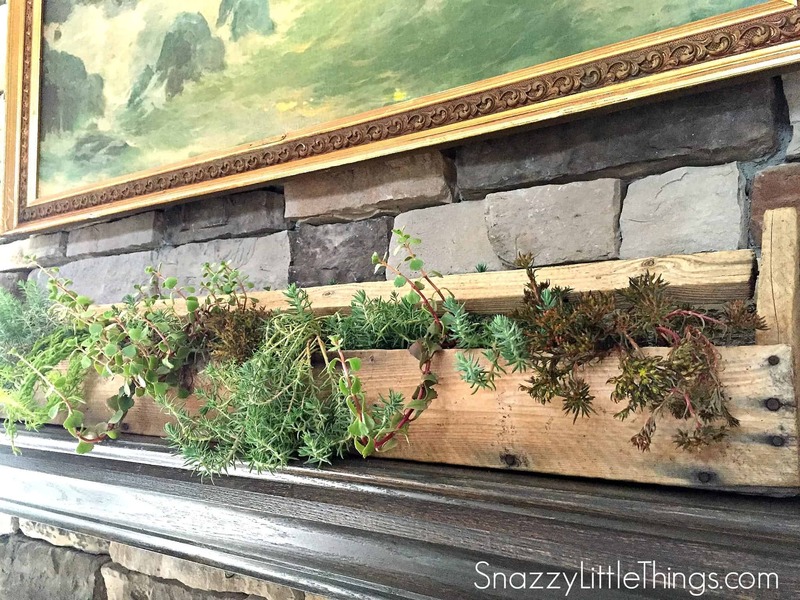 A great idea if you like to change your vignettes each season, and you want some versatility with your artwork. You probably spotted this in my fall home tour yesterday. But like most pieces that I repurpose…there’s always a backstory. This purchase was all about the frame. 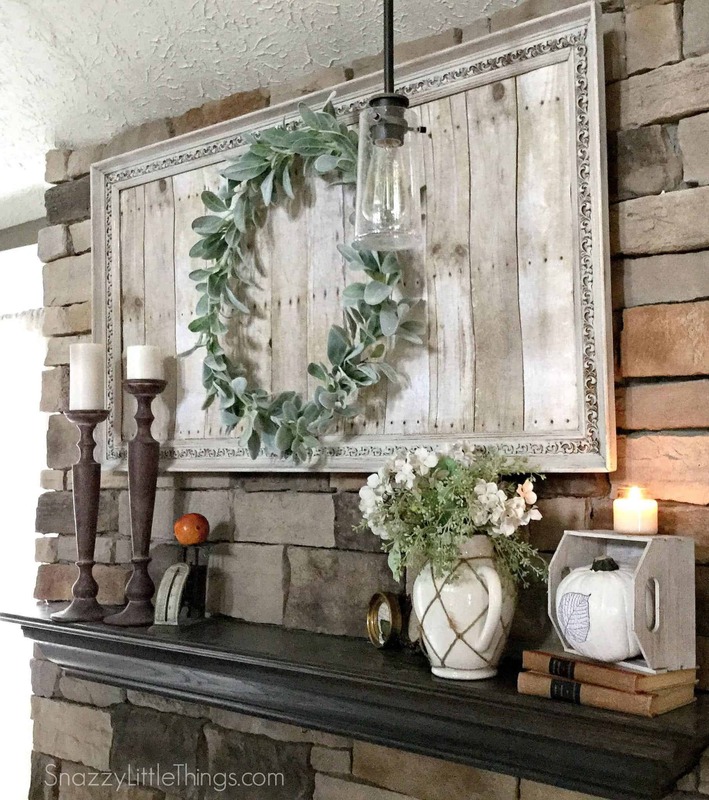 Sorry for any art purists out there, I realize this DIY may not sit right with some, but I was desperate for some art over my mantel that was the right size. 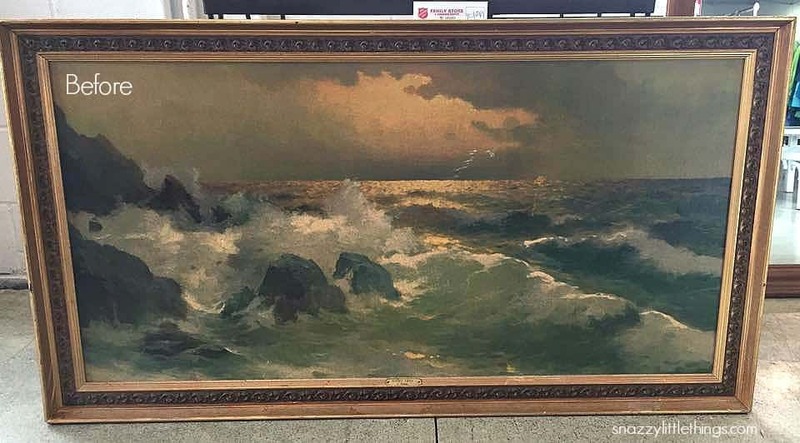 For $14.99 I couldn’t pass up the frame, but I wasn’t too sure about the artwork. And it was pretty smelly with some water damage. This reminded me of 1960’s art from old motels. So I did a little research and found out…I was right! It hung above the mantel for about 6 months. To be honest – the seascape started to grow on me. After awhile, the verdict was out. We didn’t love the gold frame, but we wanted to salvage the art. Maybe someday we’ll decide differently. But for now, that’s the direction we’re going. Ok, so now the paint brush was calling my name. 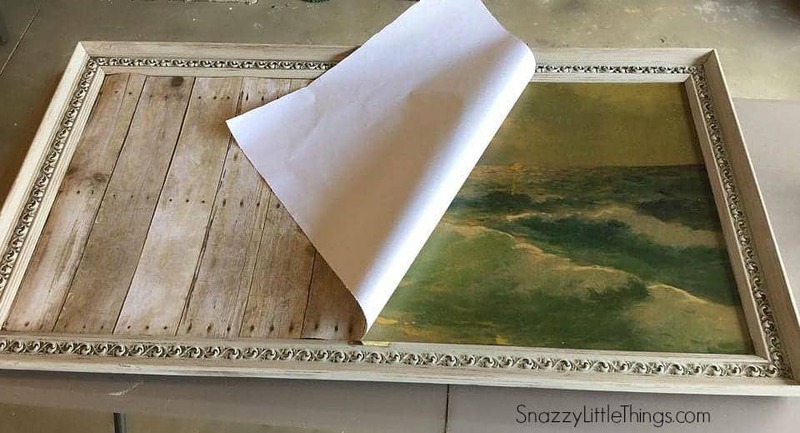 Step 1: I taped off the edges, then drybrushed the frame with Martha Stewart Chalk Paint – just enough to highlight the embellishments. I’ll be honest I was dying to do this for months, I don’t have a lot of gold in the house, and I knew it would be beautiful. One drybrushed coat is all it took to make it “pop”. 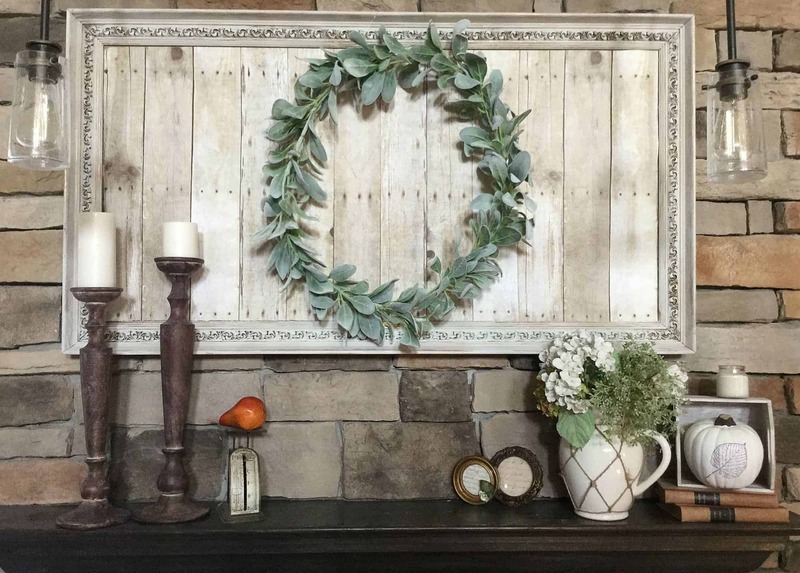 Step 3: If you want a permanent solution, you can carefully Mod Podge this piece right onto the old canvas, but keep in mind that there is no going back once you Mod Podge. It’s permanent. In my case, we only wanted to cover the seascape temporarily. So I sprayed the back of the paper with repositionable adhesive spray, and tacked it down onto the canvas once it was sprayed (I did not spray the art itself, only the paper). It fit like a glove, and I couldn’t believe how gorgeous it already was. We talked about the options and what to do next. Vinyl appliques might work, but I opted for a 3D effect by hanging a floral wreath off the back. I created the wreath using floral found at Walmart. Hung it in the center, then rehung the art over my mantel. This worked much better than the gold and blended with the rest of my room decor. Up close shot of the finish. The best part is this can be repurposed again by removing the faux wood / paper cover. So. My kids are happy. I’m happy…my husband is definitely happy. And if we ever need our seedy hotel art fix, we can always remove it and display it again, in all its original glory. Jeanette Lockmiller is a participant in the Amazon Services LLC Associates Program, an affiliate advertising program designed to provide a means for sites to earn advertising fees by advertising and linking to SnazzyLittleThings.com. Jeanette,just found your blog and am so amazed at your talent! 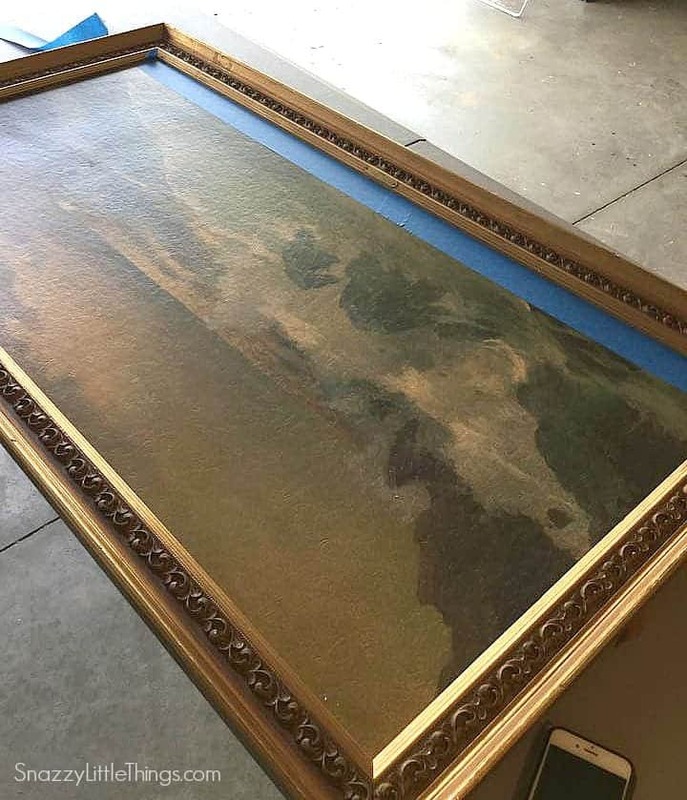 I have a large gold frame that is too gold…….I would like to tone it down without ruining the frame could I use the same paint you used on your frame to accomplish that ? Thanks for the ability to subscribe to such a helpful,lovely blood as yours. Shirley welcome! And thanks for the compliments. 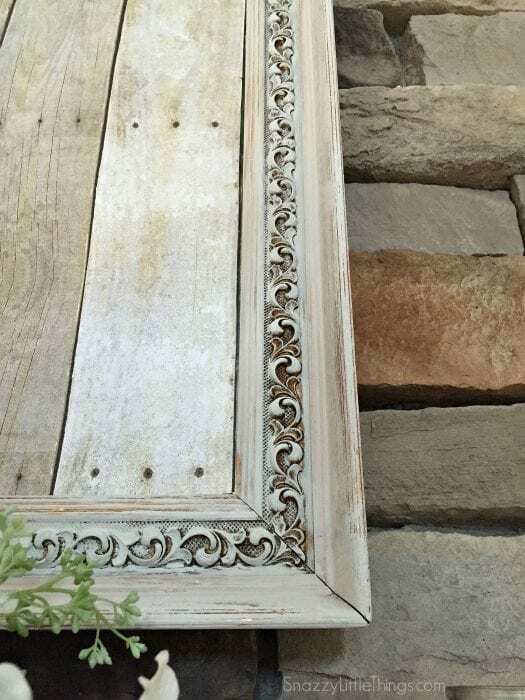 I am thinking that any paint will probably “ruin” a frame especially if it’s something you really like, but just want to tone down the brassiness. However, I would maybe try mixing the patina with other metallic paints (several variations) closer to the color that you want. Then you can dry brush (like I did in this tutorial) in layers. Make sense? I will email you also to see how I might help. Happy to have you here with us! Thank you so much, this will help me a lot! Great tutorial. Laura, I appreciate you taking the time to comment…have a great day! Wonderful tutorial – thank you so much! Very cool, I have a stack of old prints and frames in the garage, but I’m running out of wallspace. This is a great idea, with cork behind it, could be a fab message board. And chalkboard paper would make it a fab chalkboard. Good ideas, now to my stash! oh my, oh my! first time to visit your blog. had to go back and forth over each frame 3-4 times to take in all your lovely details, my brain was soooo excited!! signing up right now! Thank you! Thank you so much Ruby! I’m glad you’re here! Hi Rebecca! The link where you can find the paper is right under the photograph (of just the paper). Hope you’re able to find some maybe the craft stores in your area will have it. Brilliant. It looks fab. you took a teensy bit more care and time that needed, in my humble opinion, caring for the original artwork. I’m sure you could paint something just as fabulous right over that old art if you wanted to. This really makes your mantle look sweet. Thank you Darla…I appreciate you taking the time to comment. 🙂 We like the change, but eventually will enjoy changing the art back again to the original. Hi Jeanette, I have almost the same picture that I paid $1 for in a garage sale. So far it has been used as a photo board when my partner had a milestone birthday. Have you seen the artworks which have typography over the top of old seascapes to make them something new? I was trying to find one to put a link but I can’t locate one now. I think that’s what I might try with mine next. I really love this! Wonderful re-use project and I already have the paper…thanks for sharing! This is beautiful! Love this idea! So glad I saw it posted over at Motivation Monday Linky Party. Pinned it. Hello. I just saw this post on Hometalk and I know it’s a stretch but is there any chance your ocean scene is signed Carrasco or Betty or maybe BCarrasco? That whole set up looks (painfully) familiar as something that hung in my living room as a child. B Carrasco is my grandmother. Thanks so much Marie! We love that it’s versatile for all seasons. I appreciate you stopping by to comment. I Just love how this turned out! You’re my pick for this weeks DIY Sunday Showcase! I love the finished product here! I’m a sucker for anything rustic and I just love that it’s faux wood. I’m definitely going to keep this project in mind the next time I go thrifting. this is amazing! I thought it was real wood and thought that a clever enough idea but lots of work. where do you get that paper? I will reread post in case it says. I see you did put link for paper you used. thank you. Is that light enough to use as wrapping paper too? This is a brilliant idea. I thought it was pallet wood! I love what you did, but I love the painting more. The exact one hung in my grandparents house, and I always loved it as a child. My grandma gifted the painting to my uncle who lost it between moves. If you have any inclination to sell it, I would be interested. Oh wow! That turned out gorgeous! I thought that it was real wood, Love it!